Toro recently introduced a new bagger attachment for the GrandStand® and GrandStand MULTI FORCE™ stand-on mower product lines. 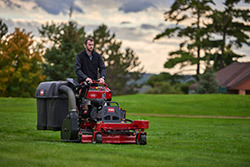 With the addition of the Powered Bagger attachment, Toro offers the unique ability for landscape contractors to efficiently collect grass clippings while taking advantage of all the benefits of a stand-on mower. The Powered Bagger attachment was developed with productivity in mind. The compact design of the side-mounted soft twin bagger and vertically mounted blower allow for excellent maneuverability in tight spaces and maximum visibility during operation. The Powered Bagger boasts an impressive 10 cubic ft. (8 bushel) capacity, which ensures fewer trips for the operator to empty the bags. Additionally, the top cover of the bagger attachment opens easily for simple access to the bags and the quick release design allows operators to switch from bagging to side discharge.